About a month or so ago I was contacted by the local NBC affiliate here in San Diego to get my thoughts on a story they were working on based on a report they had received from their Washington DC office. The story was about a woman that someone from the DC station knew who’s 2nd gen iPod Nano exploded and caught fire while charging. The basic spin they wanted on the story was that iPods were potentially unsafe and could catch fire. Trouble is, neither I nor any other expert they could track down would play along. In the end they ended up doing a broader piece on dangers of lithium ion batteries. Maybe not 100% accurate, but there have been some recalls and (despite the sensational promos and story headline) the story did a fairly decent job explaining that in normal use these batteries are relatively safe and it’s only when the batteries are improperly handled that there could be some issues. I was interviewed on camera for over 20 minutes and ended up with just a quick sound byte at about 3:11 in. You can see the whole segment in the Quicktime video above (click the image to play). They did get a nice shot of the modded Apple logo on my G4 iBook. 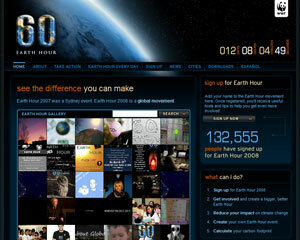 The Earth Hour event was created by the World Wildlife Fund (WWF) in 2007 and was designed to raise awareness and support for fighting the effects of global climate change. I personally was not aware of the event until the Twitter from Scoble and I think it’s great to see Google supporting the cause. I personally will be sitting in the dark tonight from 8:00 to 9:00PM. Care to join me? Good news. GoDaddy recently updated some equipment and the Maccast server and it’s OS were the recipients of some tweaks. At the very least things should perform a little snappier around here. Thanks GoDaddy! A podcast about all things Macintosh. For Mac geeks, by Mac geeks. Show 220. Adobe position on Flash for iPhone clarifies. Airport updates. Safari 3.1 released. Other Apple updates. Rumors of a pending iTunes subscription model. Mac Mini ready for rebirth? One more step for admin to user account conversion. Apologies to Growl. Wi-fi issues? Check your channels. More info on iPhone audio interference. Apple missed some things with the iPhone user experience. New photo enhancing app for keyboard jockeys, Iguania Review of Newsfire. iCopy, the solution for iPhone copy/paste? Mac maintenance, what should you do? New music, “Sparkle Nice Too” by MayBTed. Just a quick note to let you know that there will be no Maccast Loop today (3/23) because of the Easter holiday. Victor and I will be back next week at our regular time, 10:00 AM (PDT). See you then. A podcast about all things Macintosh. For Mac geeks, by Mac geeks. A special episode of the Maccast from Macworld 2008. I talk with AJ from Marketcircle about the fallout from his now infamous “Apple should keep out of the enterprise” blog post. We discuss how it was sensationalized by the blogs and online community and get to the real intent behind the piece. We also discuss Marketcircle’s latest product updates to Daylite and Billings, plus touch on AJ’s thoughts on Apple’s new Macbook Air. A podcast about all things Macintosh. For Mac geeks, by Mac geeks. A special episode of the Maccast from Macworld 2008. I speak with Sam from Netgear about some of their new offerings in storage. The ReadyNAS Duo is a new two drive version of the popular ReadyNAS NV+ line which Netgear acquired from Infrant Technologies last year. Faronics – Deep Freeze your Mac today. Macbook Pro Price Drop Coming? Eagle eyed listener Stephen recently spotted something interesting on this Apple Store for Business page on Apple’s site. The page is promoting Adobe CS 3 and lists some recommended configurations for Macs along with their starting prices. The starting price listed for Macbook Pro is $1,699.00, not the $1,999.00 price currently displayed on the main store site. Now, I thought it also curious that the Mac Pro is listed on the same promotional page as starting at just $2,299.00 when the base configuration is $2,799.00. The answer here though is the Mac Pro can be custom configured with a slower processor lowering the price down by $500.00. The Macbook Pro has no such option. 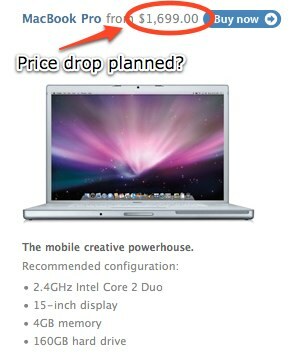 The only other possible explanation is that the Macbook Pros were base priced at $1,699.00 before this latest update. I don’t remember that being the case. I tried to do some searching around and I am pretty sure they have been starting priced at $1,999.00 for a while now. So what do you think? Is this a simple web update error or is there a price drop in the Macbook Pros future?